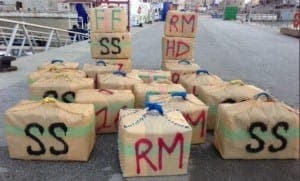 A DRUG-LOADED fleet of boats dumped around £3,000,000 worth of hash in Gibraltar waters before fleeing from police. The RGP Marine section gave chase after noticing five suspicious vessels off the eastern seaboard. One boat was intercepted, but failed to stop and its crew were seen throwing bales into the sea two and a half nautical miles off Eastern Beach. The pursuit was abandoned when the boats left Gibraltar waters. Twenty-one bales of cannabis resin weighing 30kg each were recovered by RGP officers.